Made in United States, North and Central America, c 1900. In 1878 Dr Gustav Patrik de Laval (1845-1913), a Swedish engineer, invented the first continuously-operating hand-cranked cream separator in 1883. It comprised a very efficient nozzle and produced a powerful and efficient impulse turbine. Impulse turbines work like windmills. A jet of steam blows from a nozzle and turns a set of blades around. This idea goes back as far as the 1500s when an Italian inventor, Giovanni Branca, designed a reaction turbine. Even before this, Leonardo da Vinci had sketched a meat spit, driven by hot air from a fire, in effect an impulse turbine. Aktiebolaget Separator was established in 1878 by de Laval and Oscam Lam in Sweden. The parent company became Aktiebolaget Separator or AB Separator from 1883. The separators were named 'De Laval' after its inventor. De Laval purchased the rights to improvements to separators devised by the German inventor Clemens von Bechtolsheim using a series of disks, "Alfa Discs" in the separator bowl from 1890. These increased the output and the 'Alfa' name was incorporated into the name as Alfa-Laval. The firm acquired the AB Omega Separator in 1921; Baltic Separator and Pump Separator in 1923; Domo Separator Co. in 1928; Diabolo Separator Co. in 1931; and the Eskilstuna Separator Co. in 1939. It became part of Electrolux Division in 1959. Subsidiaries of this company included The Domo Separator Co. of Brisbane, Queensland, and the Diabolo Separator Co. of Adelaide and Brisbane. Some companies preferred to keep the name of the inventor, particularly in USA and Canada, such as the De-Laval Separator Co. where the Alfa-Laval name was only adopted in 1979. The parent company, although marketing Alfa-Laval products worldwide, was known as AB Separator until 1963 when it too adopted the name Alfa-Laval AB. 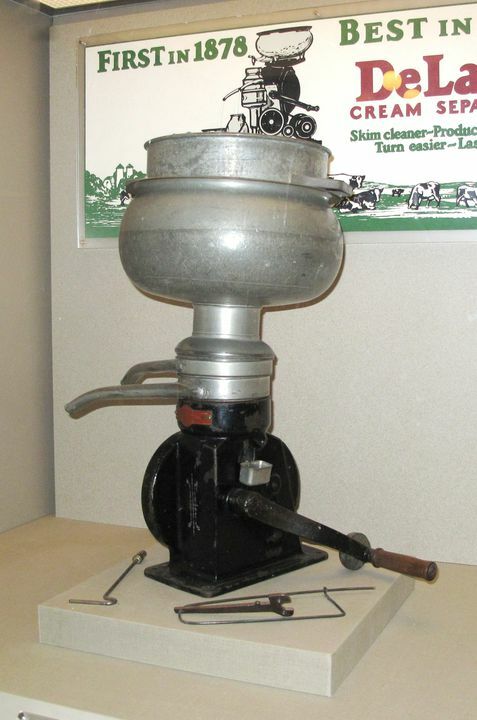 Manufacture of cream separators was phased out in 1962.